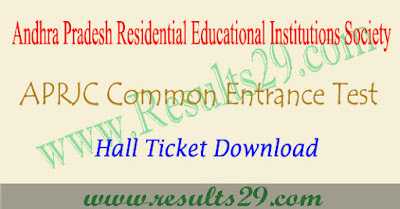 APRJC cet hall ticket download 2020 @aprs.cgg.gov.in : The hall ticket of APRJC 2020 will be released by APREIS in online mode online it will be placed on aprs.cgg.gov.in Only those candidates were able to download the APRJC hall tickets who have successfully submitted their online application form for the session 2020-2021. Candidates are advised to check regularly for APRJC 2020 hall ticket week days before the date of exam. Hall ticket is the mandatory and important document that is required for appearing the entrance test. APRJC hall ticket is being available online only . Applicants can download the admit card from official website. Candidates can also access the direct link from here to download the hallticket . Students are advised to keep the hall ticket carefully till the completion of aprjc counselling process. 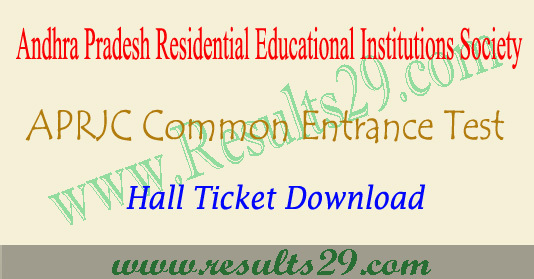 Candidates can download their aprjc cet hall ticket from the website at aprs.cgg.gov.in or www.apresidential.gov.in from 27th April to 3rd May 2020 (Expected) with the reference number allotted to them. Candidates have to aprjc hall ticket download 2020 from the online website only. No printed hall ticket shall be posted to the candidate. Request for issue of duplicate Hall Ticket will not be entertained. Without permission letter, no candidate will be allowed to appear for the entrance examination. The aprjc Inter admissions hall ticket will carry the candidate’s name, exam time, exam schedule and aprjc entrance exam center details , particulars about candidate’s identity and back side of the hall ticket has given instructions related to examination hall. Candidates can download aprjc hall ticket from the link below on this page. Print aprjc hall ticket 2020 and preserve it.